Felicia Day, Chris Hardwick (center) and Wil Wheaton see YouTube as the future of nerd-centric programming. While broadcast television continues to develop shows that revolve around nerdy characters, the actual nerds in Hollywood have turned their backs to the establishment. 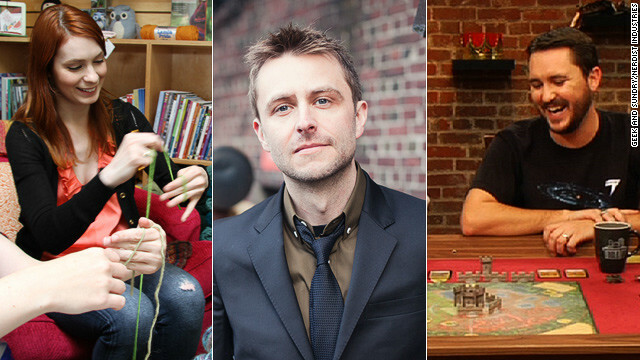 Two of Los Angeles' geek community ringleaders, Chris Hardwick (one-time host of MTV's "Singled Out" but better-known for his "Nerdist" podcasts) and Felicia Day (of "Dollhouse," "Eureka," "Dr. Horrible" and "The Guild" fame), chose YouTube as the destination for their newest programming ventures. Hoping to create entertainment hubs that appeal to geeks, nerds and other fans of niche programming, Hardwick launched the Nerdist Channel on Monday, and Day launched Geek & Sundry. The Nerdist Channel's lineup, which includes "Face to Face With 'Weird Al' Yankovic," "Neil Patrick Harris’ Puppetopia," "Ain't It Cool With Harry Knowles" and "Weird S#!t from Japan," is an extension of the Nerdist brand and philosophy that began with Hardwick's website, and then podcast, in 2008. "I noticed that traditional nerd culture had really taken over pop culture," Hardwick said. He calls this cultural movement "nerdism," which is the advent of nerds that do not only voraciously consume any media having to do with gaming, science fiction or fantasy but who also create the media they want to consume.